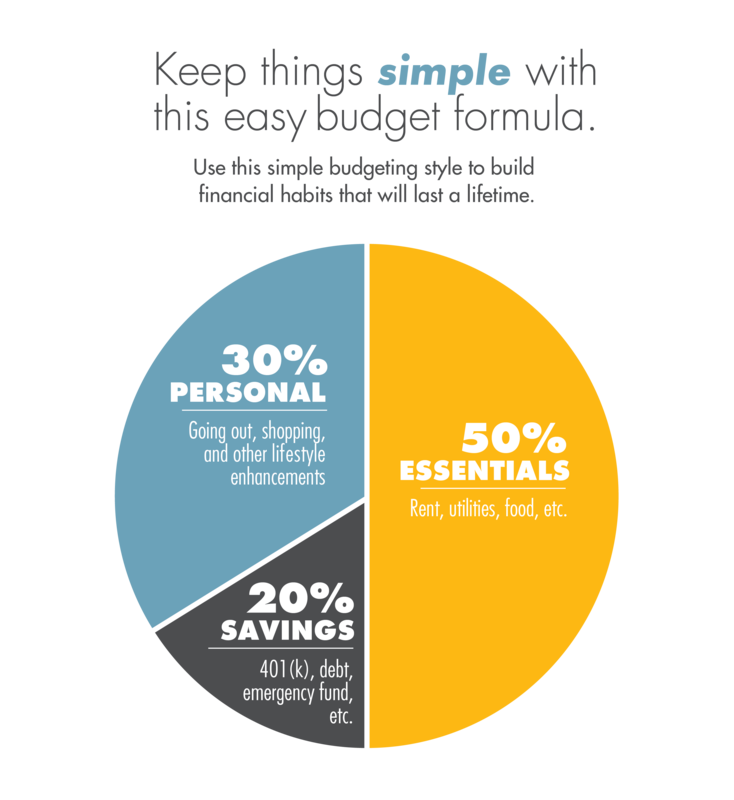 Make a simple budget that reflects your lifestyle, and understand the steps to financial health. Building credit, saving money, paying off debt, and more are all elements of a successful budget. You’ll learn how to get started, from wherever you are, and how to continue to improve your financial health over time without losing out on fun. Whether the word budget makes you feel anxious or excited, knowing how to keep track of your money, especially in your 20s, is a crucial step to financial literacy. It’s easy to feel like you’ll be weighed down by spreadsheets and unable to have a good time with a budget, however, budgeting is simply knowing and planning where your money is going. In this piece, we’ll take you through how to make a simple budget using a foolproof formula, the four areas of importance when achieving optimal financial health, and how to stay accountable when things get tough. Managing your spending is the first step. Start by building out an easy budget. You can use our accompanying mini graphic as a rough guideline. By categorizing and understanding where your money is going, you’ll be able to determine where you can make improvements and what’s unavoidable. For instance, if you live in a place with a high cost of living, you may not be able to reduce there. However, you could try to make lifestyle shifts that help you reduce spending, like biking to work or bringing lunches. Managing spending is challenging, and forming new healthy financial habits takes time. Exceptions are okay, but when they happen more than once or twice a month it’s time to reevaluate. Don’t beat yourself up if you make mistakes, take the time to understand why they happened and how you can be successful next time. Know that it will take time for you to build up new habits and adjust to the change. Be gentle with yourself during the process. Not everyone is able to save money depending on their financial commitments and situations. If it is at all possible, saving money and paying off debt is a crucial step to achieving financial stability. Building an emergency fund is a great first step. Working towards having 3-6 months of living expenses will help you feel secure. If you have to use some of the money to pay for unexpected things while you’re saving, don’t get discouraged. Just do your best every month, and try to stick to your budget. If you can’t save right now, it’s important that you make a plan for how you can get to that point as soon as possible. Saving while you’re young is what will set you up for financial stability later in life. While you’re young, investing means you’ll reap the benefits as long as possible. With the power of compound interest, you can make huge gains. Your retirement accounts will also have a greater impact, as you’ll be giving your money more time to grow. If your employer does matching contributions, you should be participating to the fullest extent you can. When you don’t, you’re leaving free money on the table. Credit isn’t just about what you can buy. It’s the key to almost every major purchase we make. From auto loans to apartments, building your credit will get you better rates and help you throughout life. Even if you don’t plan on making a large purchase, credit cards can also help you get perks that save you money. Just remember: never spend above your means, even on a credit card. Treating your credit card like a debit card and paying it off in full is what will help you build that credit, as well as keep you out of hot water. Getting your finances in order can be overwhelming. Finding a buddy, whether it’s a partner, roommate, or parent can help you stay accountable to your goals. Even if you don’t share your budget numbers with them, checking in regularly about money keeps you on track. Stay in touch and troubleshoot if there’s an area that you’re struggling with. 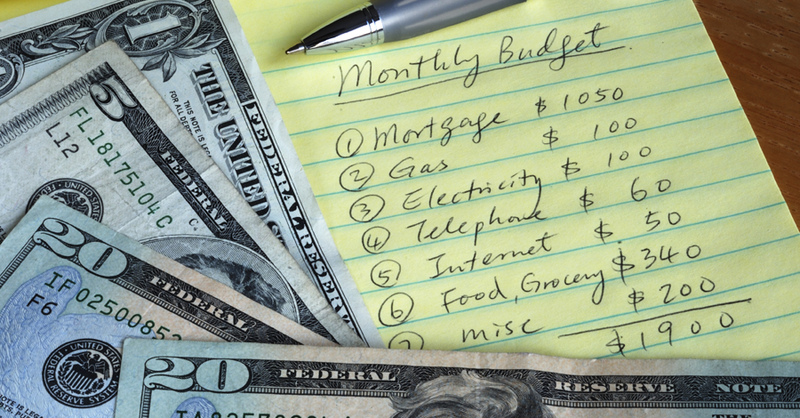 Getting into budgeting doesn’t have to be complicated. Keep things simple and remember that it takes time to get into good financial habits. Give yourself space to learn and don’t be afraid to ask for help, whether it’s from someone you know or a financial advisor. It’s never too early to start planning for the future.